Moral dimensions of Open, part 5: whose responsibility is this? In this short series on the moral dimensions of open (particularly open access), we’ve considered why this is important, the argument that zero marginal cost should result in zero price, the idea that the public has a right to read what it paid for, the very high profit margins of scholarly publishers, and the crucial observation that science advances best and fastest when we can build on each other’s work with minimal friction. I’d like to bring the series to a close by asking this question: if we want change, who is responsible for bringing it about? Often, those most committed to open-access ideals are students and early-career researchers. But we may feel that those just starting out on their careers are the ones with most to lose (or with the least to gain) if they make pro-open stands such as only publishing their work in open-access journals, or agitating for change at their institutions. Perhaps the responsibility lies with those who have already acquired positions in academia? There are two problems with that. One is that even an academic who has a job wants to present the best possible case for promotion — and, when it’s available, for tenure. The other is that even those who are fully secure and happy in their posts do much of their work in collaboration with Ph.D students and postdocs, and may feel that they owe it to those younger collaborators not to make their paths more difficult by insisting on open access. Perhaps, then, the responsibility for change lies with senior academics who hold influential administrative roles, having graduated past the point of doing their own research? There are the people with the most power to bring about change, and with the least likelihood of losing out. Yet these people earned their roles by excelling under the old system of paywalled papers and journal prestige as a surrogate for evaluating quality. Is it reasonable to expect these people to turn against the very system that gave them such success? And we can hardly expect the turkeys who work for legacy publishers to vote for Christmas. It turns out that everyone, no matter what their career stage or what their role in the world of scholarly communication, has a legitimate reason to say “No, it shouldn’t be my responsibility”. And that being so, there is only one possible answer to the question “Who should take responsibility?” That answer is, “I should”. Whoever I am. From my own unique position on the fringes of academia, I take responsibility to do what little I can to bring about the changes that the world needs in how science is communicated. From his position as a postdoc, Jon Tennant does what he can. From her first academic job, Erin McKiernan does what she can. From his relatively secure academic post, Matt Wedel does what he can. From his position running a highly visible and successful lab, Mike Eisen does what he can. And in his powerful role as Rector of the University of Liège, Bernard Rentier does what he can. It’s simply no use any one of us shrugging and saying “What can I do?” At the same time, it’s also true that, for most of us, what we can do is not very much. But the crucial truth is that by each of us doing what we can, we have done great work over the last decade in pushing towards the world we now live in: where open access is no longer seen as a fringe concern of naive idealists, but is the model used by the world’s biggest and most cited academic journal, where it’s required by 500 university policies and national policies in the USA, UK and many other countries, and where I am proud to say that my own discipline of vertebrate palaeontology now seems to happen primarily in open-access journals. So we can give ourselves a pat on the back. Go right ahead, do it now — I’ll wait. But there is an enormous amount still to do. Gold open access is absurdly overpriced. Green open access remains subject to delays, deliberately imposed by reprehensible embargoes. The obsession with journal rank continues. Open data policies remain rare, and are not well enforced. Barrier-based publishing continues to dominate by volume of published papers. Text and data mining initiatives are repeatedly stymied by publishers who bar access even to subscribers. Much of what is published as “open access” is under restrictive licences that pointlessly prohibit many ways of using the work. And there are myriad other related issues still to be resolved, such as the wastefulness of traditional pre-publication peer-review. How can we fix all these problems? The same same way we got to where we are now with open access. By each one of us doing what we can to advance sane, efficient, inexpensive, moral means of scientific communication in whatever role we find ourselves. No one of us can fix this. But every one of us can make a contribution. This blog is nine years old. Since Matt and I are both still enjoying it, there’s no reason think it won’t still be going in another nine years. Strange as it is to imagine SV-POW! in 2025, I hope I can look forward to writing then in an environment where scholarly paywalls are seen as anachronistic and laughable, where publication is faster and more transparent, where data is routinely re-used, and where researchers are evaluated according to the quality of their work, not according to the brand-name they attach to it. By the way, I might note that the OA advocates I’ve known as students all seem to have gone on to good postdocs, and the OA advocates I’ve known as postdocs all seem to have gone on to find jobs in academia. I’m not sure what to make of that observation, but I’ll just leave it here. It’s certainly true that the most useful descriptive papers are now always in OA journals, where there are no arbitrary limits on length or number of illustrations, or colour fees. 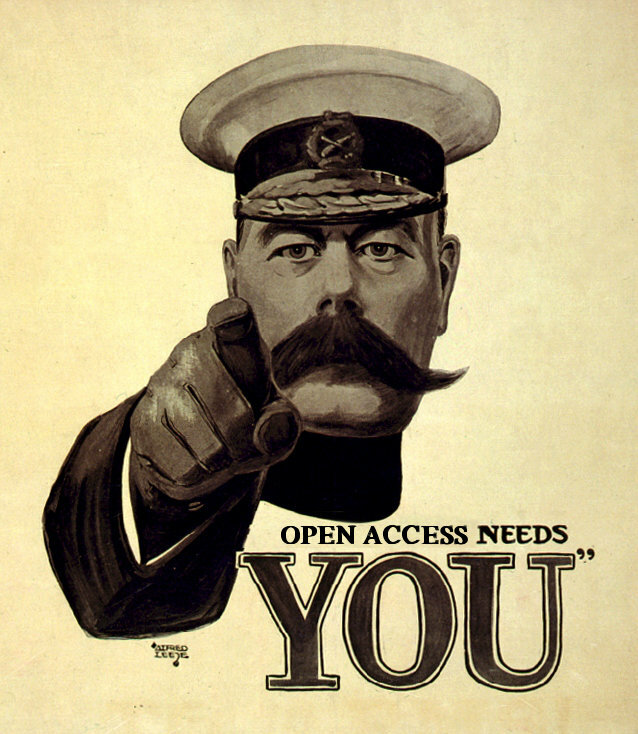 I’ll fight for queen, country, and open access, Lord Kitchener! Simply send your data files (CIF), thanks ! Regarding your first footnote, are there any actual horror stories of early career open-access advocates who found doors closed to them because of their principled position? Does this actually happen, or is it more of a “what-if” scenario? That is a great question! Anyone? Well, by deciding to not publish in the Elsevier journal Advances in Mathematics, where a number of similar papers to what I’ve worked on have appeared, I’m not doing my career any good. But I can’t say that’s “doors closed” specifically, since I’ve not even been up to the door.